That's right folks, as a result of a terrible childhood accident, Richard Dawkins lost almost the whole right side of his brain. The right side is of course crucial in the development of humility, the appreciation of the arts, and empathy for others. 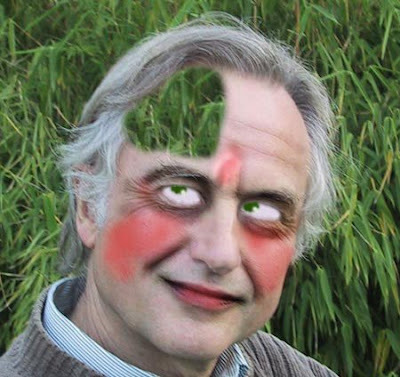 This left Dawkins controlled entirely by the left hemisphere of his brain. The left hemisphere has recently been proven by the great majority of respectable neuroscientists to be the locus of the Atheist Delusion (otherwise known as the Meatrobotism Fallacy). The science is now settled and no further denialism from Meat Robots will be tolerated. Note that this photo was taken in an unguarded moment, before Dawkins could fit his skull prosthetic to hide his injury.